Home / Article: The summer issue is here! BRIGHTON, Ontario – The summer edition of the HGO Merchandiser celebrates the highlight of our industry’s year, the Canadian Furniture Show which is set to begin its now normal three-day run on the morning of Friday, 25 May at the International Centre in Mississauga. Click here to download your copy. In our Market Preview, CFS president and chief executive officer Pierre Richard explains the thinking behind the organiser’s decision to strip down this year’s edition of Canada’s only national furniture industry trade event to its bare essentials and focus strictly on product. There will be no seminars, social events or other distractions to take the attending retail buyer away from the show floor. What’s interesting is the organisers took this tack because the surveys done with both attending buyers and exhibitors say this is exactly what they want. While there won’t be organised frivolities during show time, the event will again be kicked-off at the Canadian Home Furnishings Award gala on the Thursday evening before opening day. The event will include the presentation of the 2018 Lifetime Achievement Award to the senior management team of Stylus, Made-to-Order Sofas, the Burnaby-based stationary upholstery maker. We profile the company and interview its president, Rick Ripoli, in this issue. The evening will also salute the Eastern and Western Canada recipients of the 2018 Retailer of the Year Award. This time out, we introduce the industry to the latter honouree – Ray Kandola, the president of City Furniture & Appliances, a 22-store chain operating in British Columbia and Alberta. We will profile the honouree from Eastern Canada, Montreal’s Germain Larivière in a later issue. For the second consecutive year, Home Goods Online is pleased to partner with Zucora Home, the Canadian Home Furnishings Alliance and the Canadian Furniture Show to present the 2018 recipients of the Retail Sales Professional Awards. This program recognises and salutes excellence on the retail sales floor. In our pages, we introduce the four recipients, one of whom will be unveiled as the Canadian Retail Sales Professional of the Year during the CHFA gala. 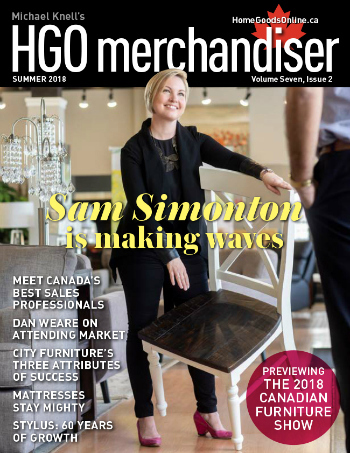 With this issue of the Merchandiser, we introduce a new series of articles devoted to profiling the next generation of leaders in Canada’s furniture, mattress and major appliance industry. For the most part, these are men and women under the age of 40 who have chosen to make their fortunes and establish their careers in this our business. For the most part, they are not only heralding change, they’re making it and setting new standards for the rest of us to follow. Ashley Newport introduces the first member of our ‘NexGen’ club: Samantha Simonton, already an industry veteran having taken on sales stints as Phoenix AMD International, Serta Canada and Ashley Furniture but is now leading our industry’s tech wave as the founder of AMY, a computer app designed to help the consumer furnish her home. This issue’s ‘Product Strategies’ essay looks at the mattress industry, which has a record setting year in 2017 as retail sales hit a new $2 billion high while domestic manufacturers’ shipments continue to bouce back. Finally, retired furniture retailer and man-about-the-industry Dan Weare answers the age-old question: why should retailers attend trade events such as the Canadian Furniture Show? His answers might surprise you, especially the part about how attendance could actually save you money in the long run. 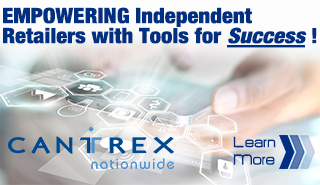 Click here to download the Spring issue of the HGO Merchandiser.